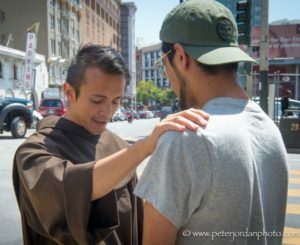 Mendicant ministry is the title we give to the service which friars offer in places where new methods of ministry and other kinds of work challenge them to move beyond the tried and true. Mendicant ministry is expressed in nursing care in hospital emergency rooms; pastoral work in Native American Indian villages; commitment to the foreign missions; and street ministry in urban centers—places where the Franciscan habit, or even the Catholic Church are not readily understood. By sustaining a connection with their brothers involved in more traditional ministries, such as parishes, our mendicants enliven and open up institutionally based ministries to new ventures, new settings, and to ways of spreading God's Love that are only beginning to emerge.